Be the first to share your favorite memory, photo or story of Terry . This memorial page is dedicated for family, friends and future generations to celebrate the life of their loved one. 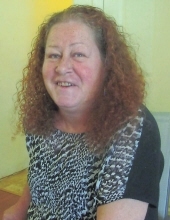 Terry Renee Sandlin was born March 9, 1965 in Madison County and departed this life Sunday, March 31, 2019 at her residence, being 54 years of age. She was the daughter of Patsy Sandlin of Tyner and of the late Roger Sandlin. In addition to her mother, Terry is also survived by her daughter, Laura Mason of Laurel County and by three brothers, Keith Sandlin of McKee, Marty Sandlin of Elizabethtown and Brian Sandlin of Berea. Terry was blessed with four grandchildren, Makayla Mason, Hallie Hensley, Dalaney Hensley and Brady Mason. "Email Address" would like to share the life celebration of Terry Renee Sandlin. Click on the "link" to go to share a favorite memory or leave a condolence message for the family.